I chose to feature the Happy Birthday digital stamp and used patterned paper with numbers on it to meet the challenge. After printing my image, I die cut it and while it was still in the die, I dusted it with Distress Ink. The image is colored with Copic markers. I used Crystal Effects on the balloons to make them shiny and there is a lot of glitter marker on this, as well. 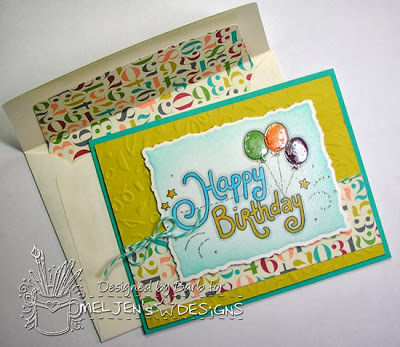 I used a Fiskar's texture plate to add some dry embossed confetti to the yellow layer. I am so glad I didn't give those away years ago, they are coming in handy now! The focal is mounted with dimensional adhesive, and a little baker's twine finished off the card. Then, I lined the envelope with matching patterned paper. This one would be easy to mass produce. I hope you make time to join our weekly challenges. They are fun and there are so many beautiful projects shared. 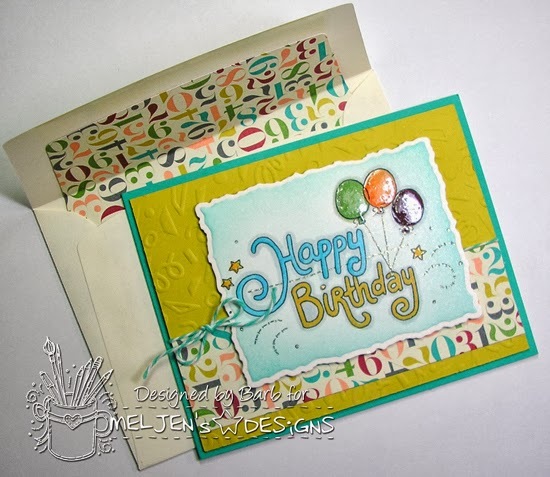 Plus, you could win FREE digital stamps of your choice. Just remember, that you must use a MelJen's Designs image on your project in order to be included in the random drawing. And, if you haven't been to the Shop lately, you're really missing out, because quite a few new images have been added. There is a super sweet Top Hat Cat, some really cool skateboards and just in time for Halloween, an adorable Top Hat Pumpkin...go check them out! And finally, please take a moment to stop by the Design Team blog and look at the wonderful samples the Team has created to share with you. so cute! 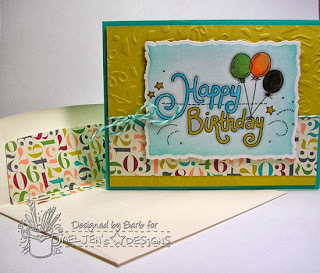 Love how the distress ink adds to the background!